Alex wearing headphones in a studio, smiling. Alex Jackson works in the Corporate Communications and Public Affairs Office at the Space and Naval Warfare Systems Command (SPAWAR), a department of the US Navy in Charleston, SC. He also leads the SSC Atlantic’s Disability Awareness Team, where he helps the office understand the needs of people with disabilities and ensure inclusion for all minority groups. Alex uses a power chair due to a spinal cord injury he sustained in a car accident caused by a drunk driver when he was nine months old. He says he never lets his disability affect how he lives life; Alex went to college, drives with an adaptive van, and is as independent as possible. 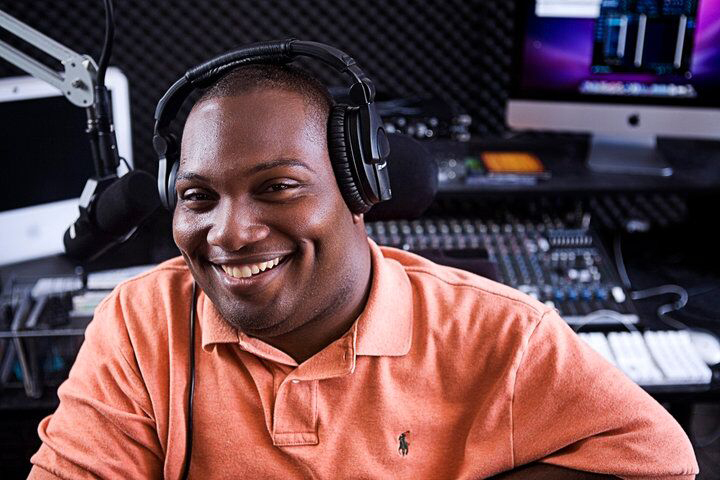 His passion for inclusion began when he was involved in radio programming at the College of Charleston, where he received his bachelor’s degree in communications. He began advocacy work related to the Americans with Disabilities Act and accessibility and eventually the college helped to make the media buildings and radio station accessible. In college, he also worked in the disability services office to ensure students had the accommodations they needed to be successful. At work, he says his employer is very open to any requests for accommodations, such as rearranging the office space to ensure he can navigate with his chair, a designated accessible parking space, and modifications to doors and bathrooms. Alex also uses a screen reader to accomplish his work efficiently. None of these accommodations were costly and each was worth the investment. Alex wants all potential employees to know they shouldn’t be afraid to speak up for their rights so everyone has what they need to get the job done. “Have a conversation with your supervisor and don’t be afraid to think outside the box and be creative in finding solutions and accommodations,” Alex advises employees with disabilities.